You don’t have to love baseball to enjoy a La Crosse Loggers game; you just have to love a good time! 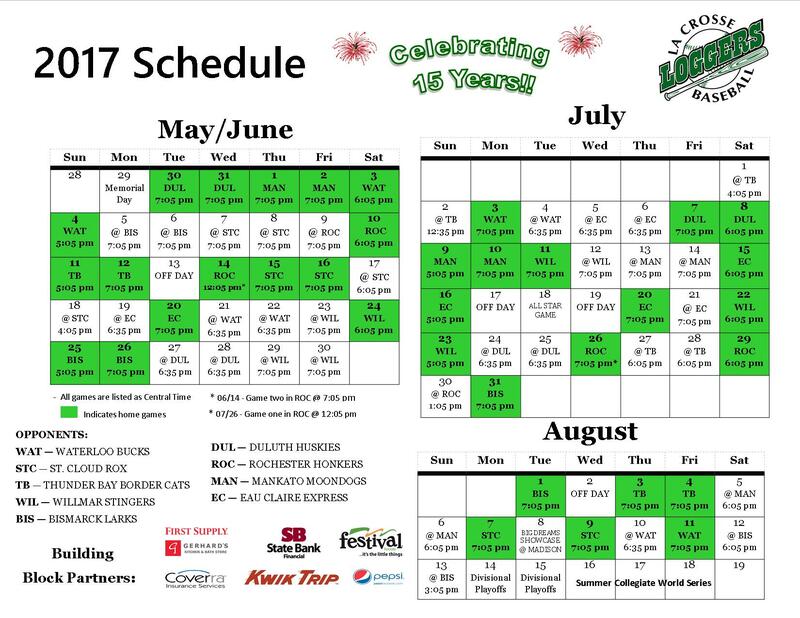 The La Crosse Loggers are a great summer collegiate baseball team with a wonderful stadium and dedicated fans. It’s a fun way to spend a summer evening! For more information on the La Crosse Loggers and other local attractions, be sure to download our complimentary Vacation Guide. It’s full of great tips about where to eat, shop, and go in the Driftless, Wisconsin area. The La Crosse Loggers, a summer collegiate league, began in 2003. In 2012, the Loggers won the Northwood League title, and are one of two teams in the country to have more than 100,000 fans for five consecutive seasons. They average over 3,200 fans per game, a pretty stellar turn-out! Players are drafted from this league to play in MLB. But apart from all the stats, this excellent team provides great entertainment for a night of fun! Here’s how to have the best time at a Loggers game! We know it will be something your whole family enjoys, and it makes a great date night too! First, check the schedule to see if there’s a game playing during your visit to the region. Home games are highlighted in green! The season goes May – August. They play a lot of games, so your chances of getting to catch one are good! You can order tickets online, via phone, or in person. You’ll find that tickets are very affordable! The concessions at Copeland Park are both affordable and delicious. So plan on chowing down with your family. Check out the menu here. In fact, if you want an all-you-can-eat-and-drink option, check out the awesome Dublin Square Sports Deck! The sports deck can turn any evening into a great party. You’ll find that La Crosse Loggers fans are loyal and dedicated! Their energy makes each game so exciting, you’ll soon find yourself cheering right along with them. We may make a Loggers fan out of you yet! After you’ve enjoyed the fun and food at a La Crosse Loggers game, complete your day with a stay at Westby House Inn. Our luxurious suites and rooms, gourmet breakfast, and mouth-watering restaurant will provide you with everything you need to relax and recharge for whatever lies ahead in your travels. Be sure to download our complimentary Vacation Guide for more information on things to do in the Driftless Area. Our area is full of activities and enjoyment for everyone, including hiking, biking, canoeing, fishing, shopping, antiques, wineries, famous cheese creameries, and more. To enhance your stay with us, check out our special offers and add-ons as well!